Whether you ride a 3-speed Raleigh Chopper on your commute to work, or you play synth in a part-time pop collective, it seems everyone likes a little nostalgia in their lives. And it is interesting to see how designers and developers are tapping into this trend, helping consumers integrate their yearning for years-gone-by, with their love of all things tech. So without further ado, here’s ten ways you can have a little new age fun…but with a vintage feel. Oh yeah. The Super Nintendo Entertainment System (SNES) was the gateway console that hooked the world on delightful-but-addictive nuggets such as Super Mario Kart and Super Mario Bros. If you’re looking to revisit your youth, or simply see for yourself what your dad has been waxing lyrical about since you were born, I reckon you can pick a second-hand SNES up on eBay for about seventy bucks. Or, if you’re nifty with a screwdriver and a soldering iron, you can procure an old SNES controller and get it to work with your Dell Streak. Just like this guy did…and he was even kind enough to give instructions on how to do it. I wouldn’t want to try it myself though. Remember arcade games? No? Well, you must be young…or maybe I’m just old. But anyway, what started off as an April Fools’ joke last year was turned into a reality as we reported last month. You can now slot your iPad into a mini retro arcade-style box, and play classics from yesteryear. And what’s it called? An iCade, of course. We wrote about this earlier in the month, but it’s worth another mention for those seeking to retrofy their lives. 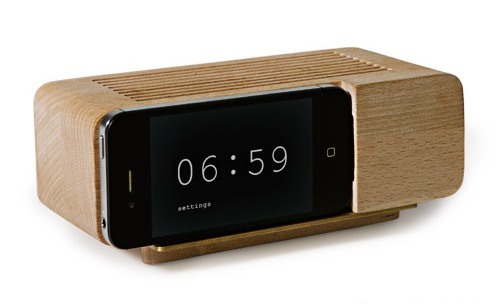 Stick your iPhone into the Alarm Dock, and hey presto…you have a good old-fashioned ‘analogue’ alarm clock. These are scheduled to ship later this year. A Polaroid camera…on your Android? There are similar apps for iOS, but given that Apple tends to steal the limelight when it comes to ‘cool’, I thought I’d focus on Android here. The Retro Camera Plus app is very cool, and it’s $3 on Android Market. It gives you the choice of five classic cameras, including Polaroid. Once you take a photo, it gives the snap a classic makeover and then allows you to upload and share across your networks. Very vintage, yet so…modern. A USB typewriter? Yup. Designed by Jack Zylkin, the USB typewriters can be plugged into your iPad or a big-screen monitor. Similar to the Dell Streak SNES set-up, Zylkin gives instructions on how to design your very own USB typewriter. But for those who struggle to even change a lightbulb, he’s helpfully produced some for sale…though they’re not cheap. And as you can see from the following video, the typewriters still work in the traditional way too…so you can hand-type a letter and send via snail-mail. Oh, and here’s a little factoid for you: Did you know that ‘typewriter’ is the longest word you can spell from the top row of a QWERTY keyboard? No? Well, it is. This one may not appeal even to the most dedicated of retro fun-seekers. The Retro Brick iPhone case goes vintage whilst ignoring the fundamental appeal of mobile phones…they’re supposed to be mobile. 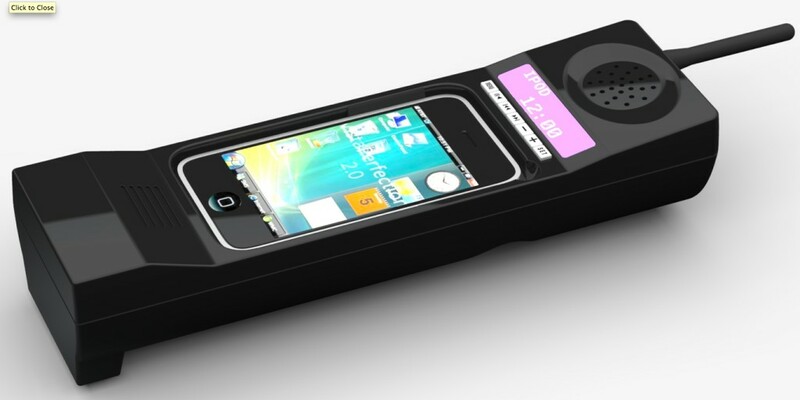 Compatible with the iPhone 3GS and the iPhone 4, you simply slot your handset in and your phone is transformed into a classic 80s monstrosity. Lovely. Okay, this is just getting silly. Would anyone really want to retrofy their external hard-drive? It seems so. 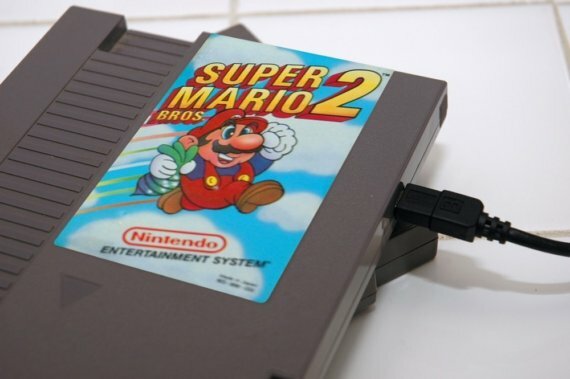 Etsy has a range of such devices for sale, and they’re made out of old console games’ cartridges, such as Super Mario Bros for the Nintendo Entertainment System (NES). It’s just the cartridge case though, and inside you can choose from 500GB, 750GB or even a mammoth 1TB. We wrote yesterday about a neat little contraption that turns your iPhone into a Leica camera. Well, as cool as it is, it can’t match the Rolleiflex MiniDigi AF5.0 for nostalgia. This is a proper old-school device, harking back to a design developed in Germany in the 1920s. But this is an updated 5mp digital version, with an auto-focus feature to shoot between 4 inches (10cm) to infinity. It’s cool. Apple certainly does seem to attract all the coolest third-party retro accessories. 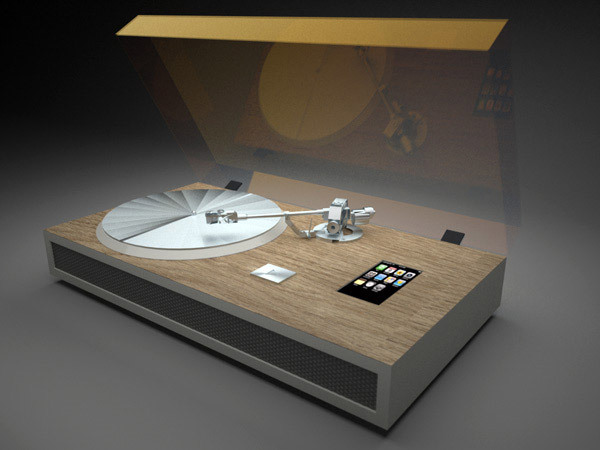 The iPhone turntable, by designer Olivier Meynard, plays vinyl records and it also converts and adds the tunes to the iPhone as it charges. Vintage, useful and ultimately pretty cool. Though these babies aren’t easy to get hold-off yet. Whilst many people retain a warm affection for vinyl, I’m not sure many people miss audio cassettes. But, they were huge for a while. And if you still have loads of audio cassettes at home, then the retro Grace Tape 2 USB device lets you convert all your cassette content to a digital format on your PC or Mac. Or, you can simply use it as a tape-player as it has a 2.5″ built-in speaker. You would probably only use this to convert all your self-recorded cassettes, as it doesn’t magically create ‘digital’ quality versions of music.